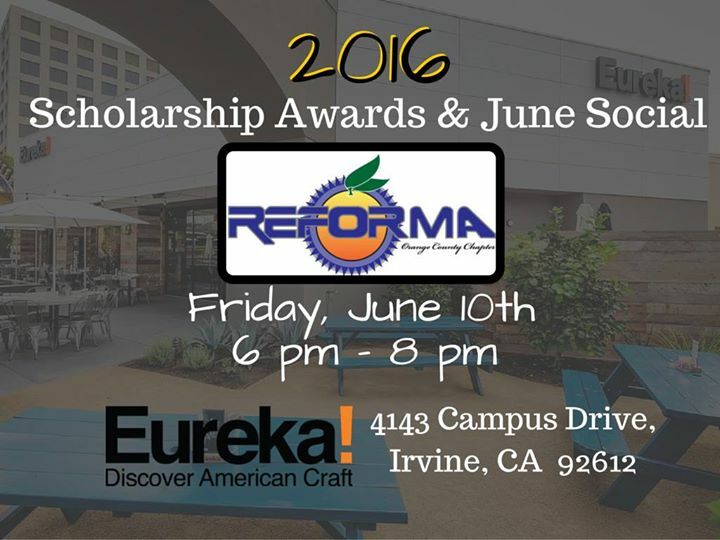 2016-2018 OC REFORMA Nominations NOW OPEN! Nominate an Orange County Chapter of REFORMA member for a position on the chapter's incoming board. You may also nominate yourself or volunteer for a position using this form. NOMINATIONS ARE NOW OPEN, submit yours here: http://goo.gl/forms/ELQLR8rJkN Positions are 2 year commitments (4 years for Vice President/President Elect). You must be an OC Chapter member to nominate someone else or to be nominated. However, you may nominate new members or invite individuals to join the chapter in order to be nominated. 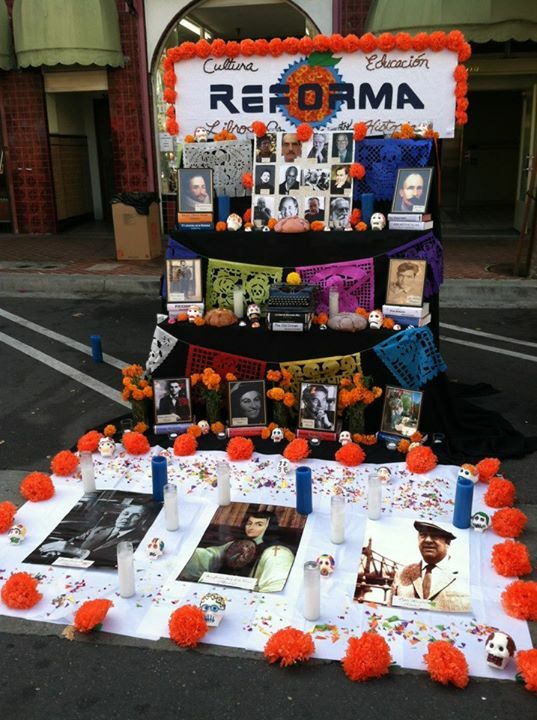 If you wish to renew your membership visit: http://www.reforma.org/join Members who have previously served on the OC REFORMA board can serve again in any capacity if nominated. Positions available: -Vice President/President Elect (will serve as chapter president from 2018-2020) -Secretary -Historian Other positions: -Incoming Chapter President: Brenda Ramirez (2016-2018) -Treasurer: Al Milo (continuing) Nominations close Monday, May 16th at 6 pm OC Chapter members will vote using an online portal and new officers will be announced at our June 10th scholarship meeting/social. Join us for our first chapter meeting of 2016! Thursday, February 4, 2016 6pm-8pm Orange County Public Libraries Headquarters Facility 1501 E. St. Andrew PL Santa Ana, CA 92705 Visitors may park in any marked stall. Once the visitor enters the lobby entrance, there is a phone available there they can call extension 90365. We will be meeting in Meeting Room A, which is the Meeting Room closest to the lobby entrance. We will discuss upcoming scholarships, elections, grants, share news and updates, and more! 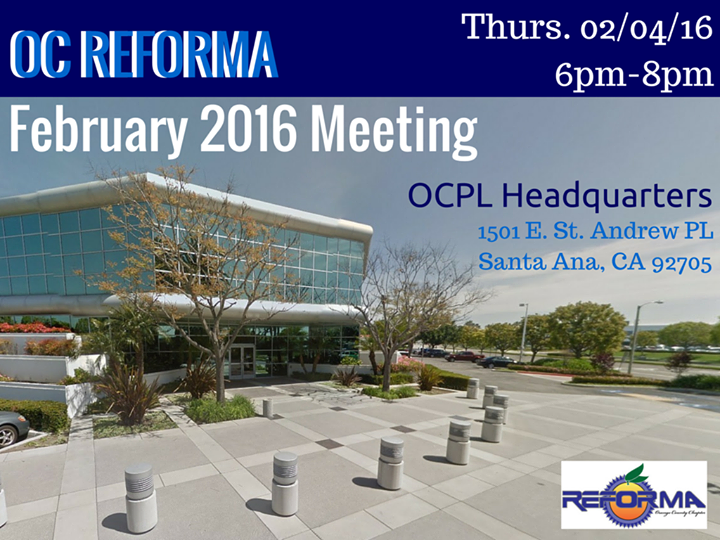 We will also receive a quick tour of the OCPL HQ building from Chapter Secretary Beatriz Preciado. Please send agenda items to David Lopez by Tuesday, February 2nd. Join the Orange County Chapter of REFORMA for a special Breakfast and Business meeting at OC’s famous, Jägerhaus. Our very own Oktoberfest! Saturday, October 10, 2015 10 a.m.-12 p.m. (approximately) Jägerhaus German Restaurant 2525 East Ball Road at 57 Fwy Anaheim, CA 92806 Check them out before we get there! http://www.jagerhaus.net/ http://www.yelp.com/biz/j%C3%A4gerhaus-anaheim-2 We will have updates on the coming year’s outreach and social activities, REFORMA national reports, member announcements, and more! Join us as we celebrate Fall! 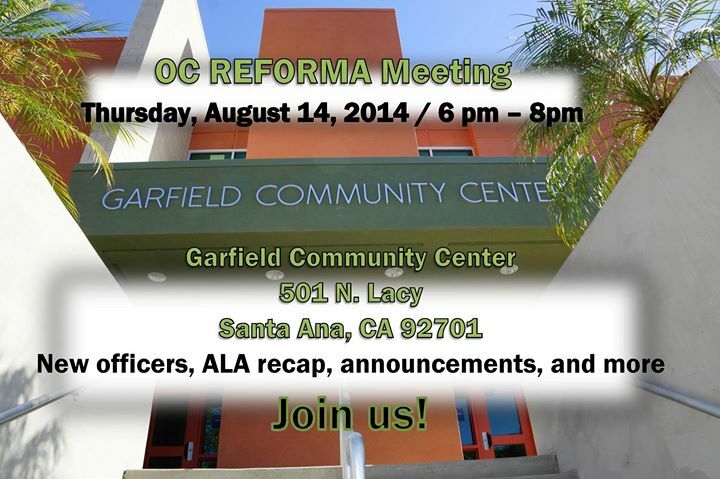 Send agenda items to ocreforma@gmail.com by 10/7/15. Please invite returning or new members as well as current or prospective MLIS students! 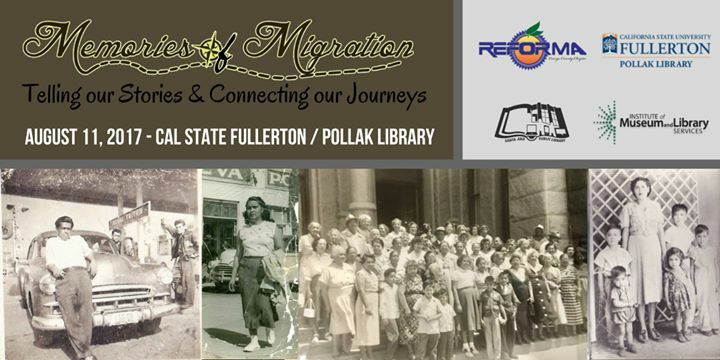 Join the OC Chapter of REFORMA for our August 2015 meeting: Thursday, August 6, 2015 Anaheim Public Library Haskett Branch 2650 W. Broadway Anaheim, CA 92804 ALA Annual recaps, REFORMA's Children in Crisis Task Force updates, announcements, and more! New and returning members welcome! Bring a student, bring a friend, bring a colleague! Got an agenda item? Send it to ocreforma@gmail.com by Monday, August 3rd. Thank you to OC member Guadalupe Gomez and the Anaheim Public Library for hosting! 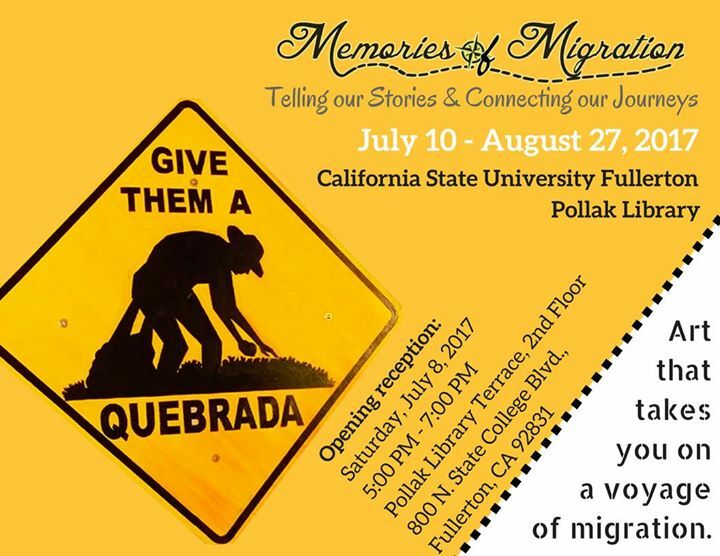 Join the OC Chapter of REFORMA for an evening of celebration as we present several deserving MLIS students with our annual scholarship awards. Friday, June 12, 2015 6:30 p.m. - 8:30 p.m. Luna Kutsi 201 N. Broadway Santa Ana, CA 92701 We will begin with a brief chapter meeting for special announcements and new business, then proceed with our scholarship presentations. The remainder of the evening will be a social gathering where you can get to know the OC Chapter members, scholarship winners, and make new friends and REFORMA familia. Menus will be available for those who would like to enjoy from Luna Kutsi's gourmet gastronomy and mixology. Luna Kutsi: The Art of Mexican Cuisine, one of the hottest new restaurants in the Santa Ana Artist Village. http://goo.gl/pxv9Fj Please send any items you would like to discuss during the early portion of this meeting by Tuesday, June 9th to ocreforma@gmail.com We hope you can join us! If you wish to attend, please use this event as an RSVP we will be using it for reservation headcount. 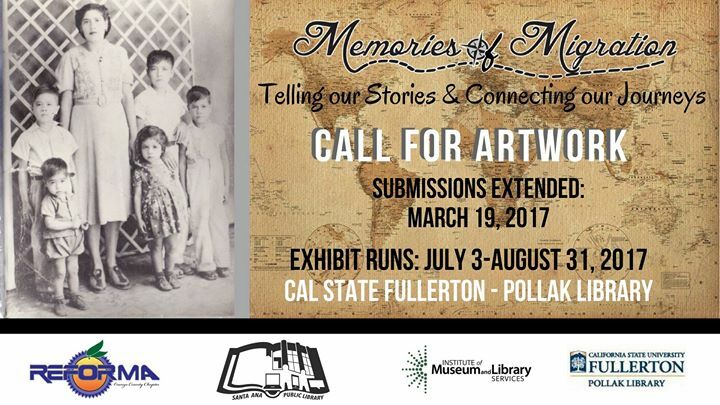 Please share with/invite MLIS students in the Southern California area. Application process is now open! 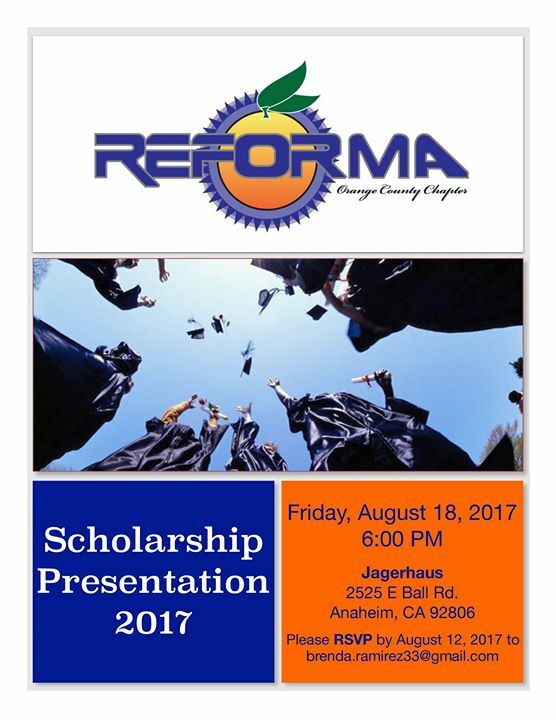 The OC Chapter of Reforma is proud to offer their annual scholarships. All applicants must be: -Currently attending or have been accepted to any ALA-accredited institution for Fall 2015 (with proof of acceptance) -Be bilingual/bicultural (Spanish/English) and/or committed to working with the Latino community Patricia Ayala Family Scholarship -Must be a Southern California resident Serrato Family Scholarship -Must be an Orange County resident DOWNLOAD THE APPLICATION HERE: http://goo.gl/bKNLcz Deadline for application is Friday, May 22, 2015 (postmarked). Only hard copies of the application will be accepted. See application for complete details. Winners will be announced at a special June 2015 meeting of the OC Chapter of REFORMA. For more information, contact: Albert Tovar, Scholarship Committee Chair (562)477-6493 albert90631@gmail.com Good luck! The OC Chapter of Reforma is proud to offer a scholarship for the upcoming RNCV (REFORMA Reforma National Conference V) to an eligible library school student. Applicants must be: -Current MLIS Students -Residents of Southern California -Available to attend RNCV during April 1-4, 2015 To apply, submit the form and short essay response by March 12, 2015 to ocreforma@gmail.com Application can be found here: http://goo.gl/7Zk0GP For those who are also interested, the form has information about the CALL FOR VOLUNTEERS which is available to current MLIS students as well. Spread the word and we will see you at RNCV! Join us for our first chapter meeting of 2015 at the OCPL La Habra Branch! 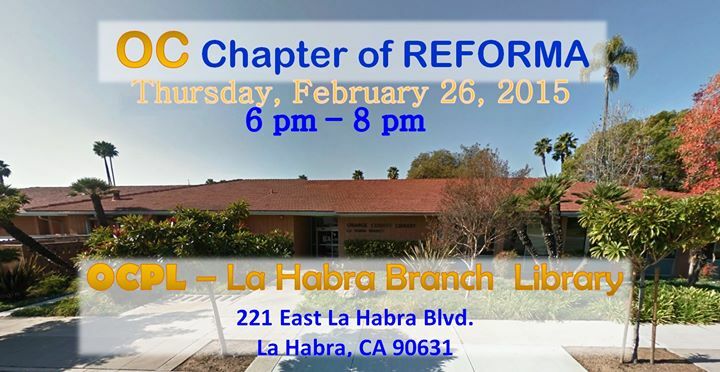 Thursday, February 26, 2015 6 p.m.-8 p.m 221 East La Habra Boulevard La Habra, CA 90631 We will have chapter updates, recaps on ALA Midwinter, the latest in RNC V planning, reminisce about our SoCal Chapters gathering, and discuss scholarships, mini-grants, and more! Send agenda items to dlopez5@santa-ana.org by 02/20/15 Join us! It’s that time of year again to celebrate when the world of the living collides with the world of spirits at Santa Ana’s 12th Annual Noche de Altares event! Saturday, November 1st, 2014 4th and Birch Streets Santa Ana, CA 1-10pm Join us for a FREE day and night full of beautifully constructed altares, great music, traditional food, vendors, and do some outreach for libraries while you’re at it! 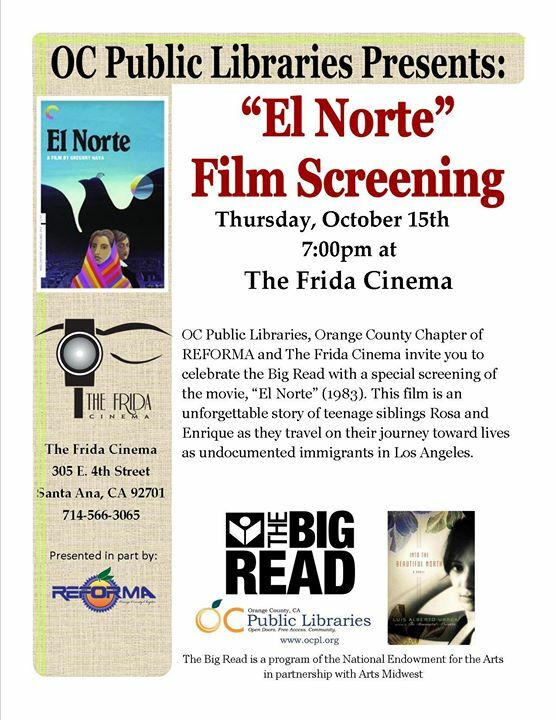 This will also be a MEET & GREET opportunity with the OC Chapter who will be joining forces with the LA Chapter of REFORMA! This year, OC REFORMA will have an information and book booth where we will hand out library information to families and 2,000 FREE books to children who visit our booth. To be a part of the fun, sign-up for as many time slots you’d like at the following link: https://docs.google.com/document/d/1YScN8s2pMBfiBITN11N887CafKTj_THTM8v8zF14UP8/edit?usp=sharing This year marks the 3rd year OC REFORMA participates in the great cultural event in Orange County and we hope to bring a strong presence in the community with our knowledge of library resources and our passion for working with underserved populations. 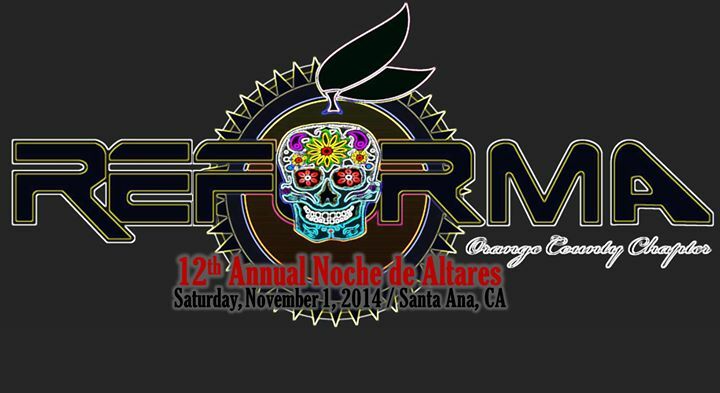 For more information on Noche de Altares, visit: http://nochedealtares.org/ or https://www.facebook.com/NocheDeAltares/ Here are some photos from last year’s successful event: https://www.facebook.com/ocreforma?ref=hl#!/media/set/?set=a.416519531803191.1073741831.256149384506874&type=3 If you have any suggestions on how to make this event a bigger success for us, please send your suggestions to: dlopez5@santa-ana.org Thank you and we hope to see you at Noche de Altares! 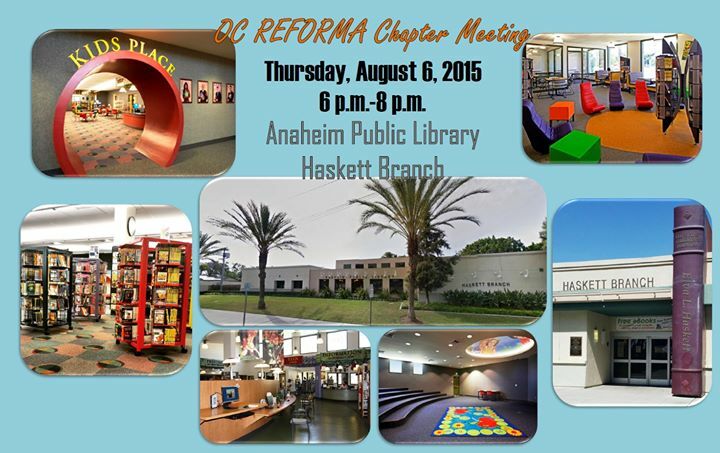 Please join us for the next OC REFORMA Chapter Meeting which will be held at the Anahaeim Public Library, Haskett Branch. Friday, June 20th @ 6 p.m. 2650 W. Broadway Anaheim, CA 92804 (between Magnolia and Dale, in Maxwell Park) There is much to celebrate, so our June meeting will also be a Summer Social where we will be recognizing our new chapter officers, our scholarship awards, MLIS graduations, library retirements, and recent acheivements! This is a potluck style social, a sign-up list can be found at the following location: https://docs.google.com/document/d/153Tzy8usYXFyoQWP6_MOcb9fzwPArJ9sTpKYHCPjFNA/edit RSVP on this event and please feel free to invite other members, it would be great to see faces new and old! Thank you to our member Guadalupe Gomez for hosting this event. Join us for our next chapter meeting! 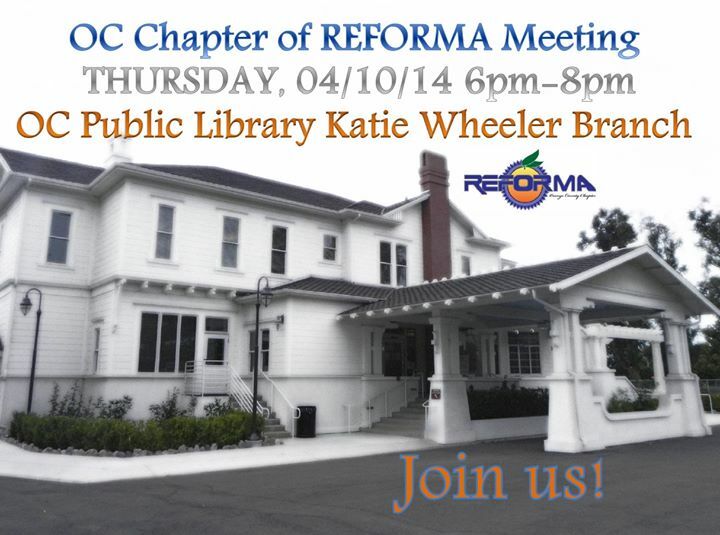 Thursday, April 10, 2014 6 pm - 8 pm Orange County Public Library Katie Wheeler Branch 13109 Old Myford Rd. 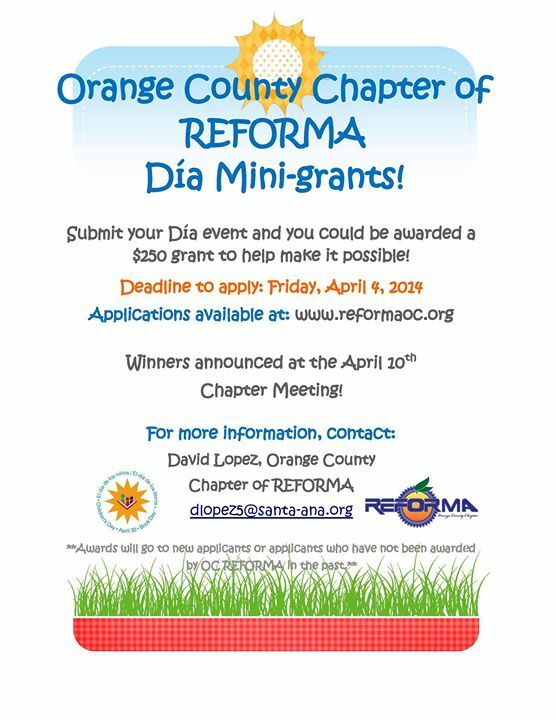 Irvine, CA 92602 We will be awarding our Annual Día Mini-grants and discussing many important items pertinent to our National and chapter organization. Hope to see you there! 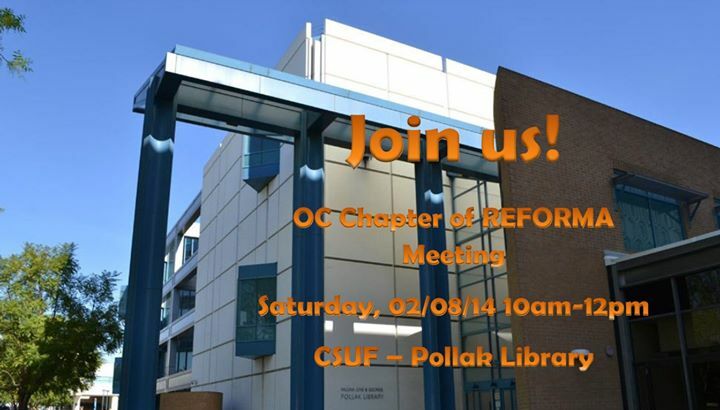 Join us for our OC Chapter of Reforma Chapter meeting at Cal State Fullerton's Pollak Library. Saturday, February 8, 2014 10:15am-12:00pm (the library opens at 10 am) 1st floor - PLN 121 (Reference Work Room) Parking is FREE on the weekends http://www.fullerton.edu/ There will be no META meeting before the regular meeting. If you have an agenda item, please send it to us by Thursday, February 6th. Hope to see you there! 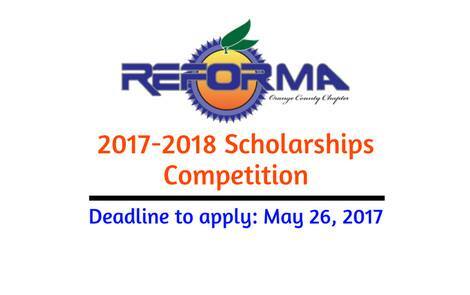 Contribute to the OC REFORMA scholarship fundraiser from March 1 - 31, 2017! 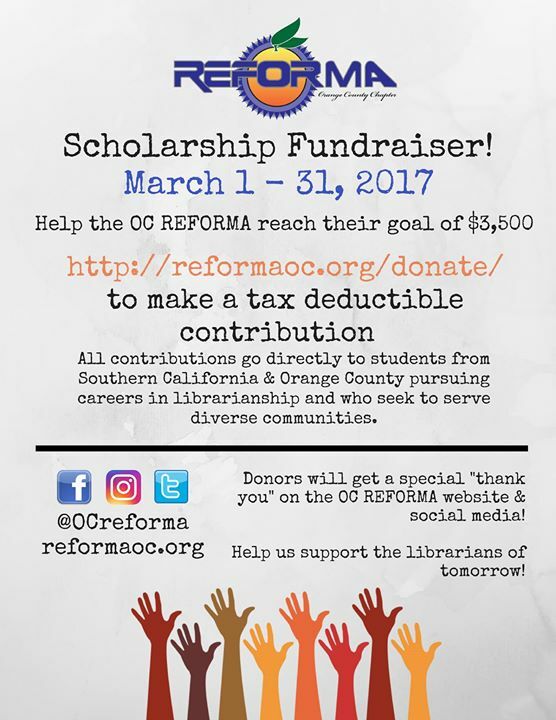 Visit: http://reformaoc.org/donate/ to make a tax deductible contribution Help the OC REFORMA reach their goal of $3,500 All contributions go directly to students from Southern California & Orange County pursuing careers in librarianship and who seek to serve diverse communities. 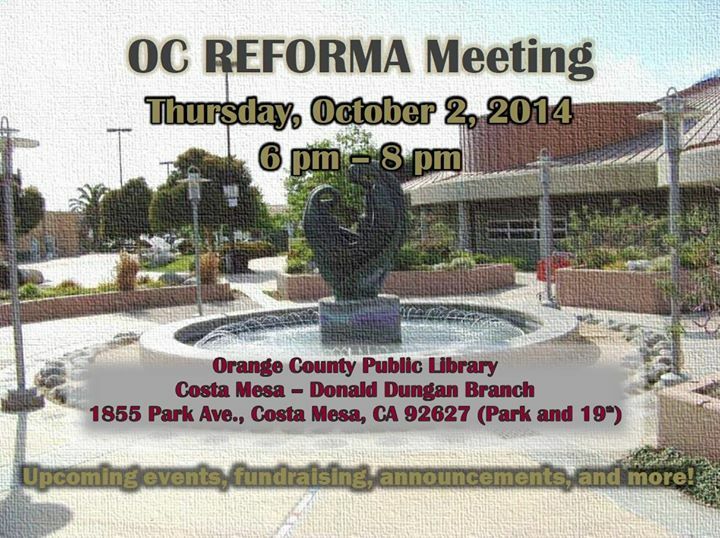 Donors will get a special "thank you" on the OC REFORMA website & social media! Help us support the librarians of tomorrow! 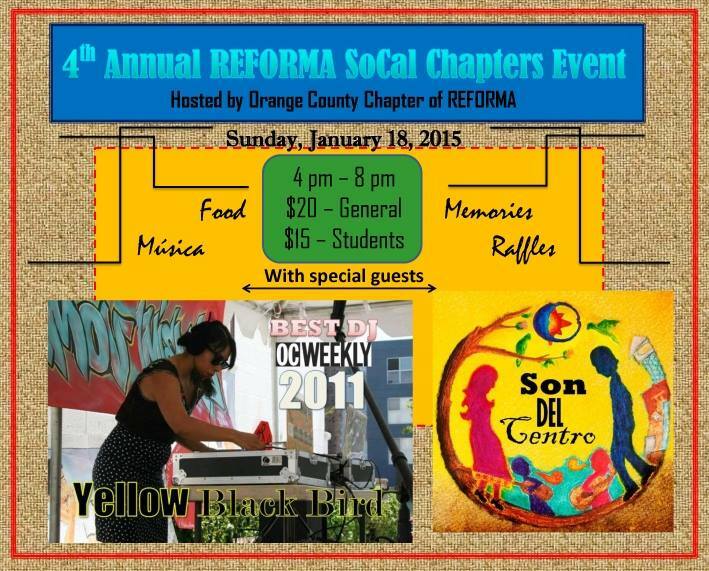 Join the OC Chapter of Reforma for the 7th Annual REFORMA Southern California Chapters gathering. Let's celebrate with a good ol' TARDEADA! Enjoy some tacos, a great selection of Mexican beers and some music by Chulita Vinyl Club Santa Ana! 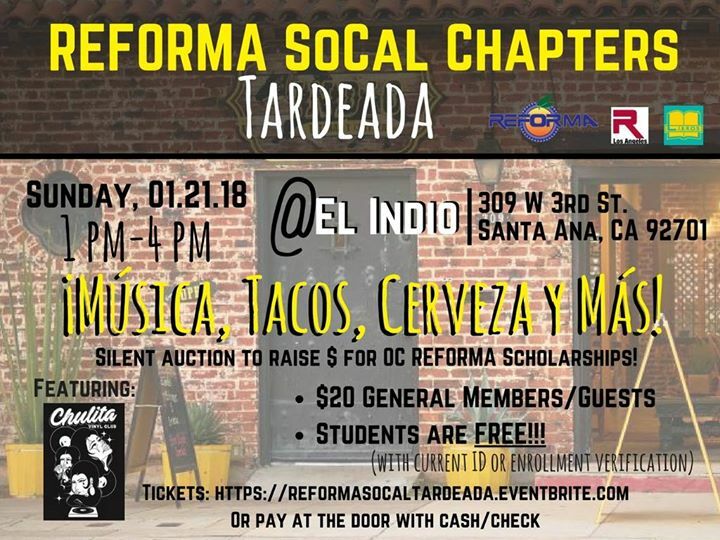 Sunday, January 21, 2018 1pm-4pm El Indio Botanas Y Cerveza 309 W 3rd St. Santa Ana, CA 92701 All are welcome: - $20 for general members and guests - Students are FREE! (with current student ID or enrollment verification) Thanks to our sponsor Al Milo Purchase advance tickets: https://reformasocaltardeada.eventbrite.com Or pay at the door via cash or check There will be a silent auction with some great items to raise money for OC REFORMA's scholarship fund. Orange County Chapter of REFORMA Invites current and future Master’s degree library and information studies students to participate in its: 2018-19 SCHOLARSHIPS COMPETITION Scholarship applicants should fulfill the following requirements: For more information contact: Silvia Cisneros Phone: 310-458-8317 E-mail: silvia.cisneros@smgov.net The Orange County Chapter of REFORMA seeks to support the recruitment and retention of bilingual Spanish/English students to the profession of librarianship through local REFORMA chapter scholarship funds. The application deadline for the scholarships is: Monday, May 21, 2018 (postmarked) To apply for a scholarship:  Complete the application form provided below.  Present proof of California residence or Orange County, California residence. [For example, a photocopy of your California driver’s license or California ID card.]  Present proof of acceptance/attendance at any ALA-accredited institution. [For example, a photocopy of your letter of acceptance, a list of current classes or an unofficial copy of your transcript.]  Include a personal statement of at least 500 words. [The statement should be typed, double-spaced, and include information about your background that is relevant to the scholarship goals and a description of your commitment to working with the Latino community.] 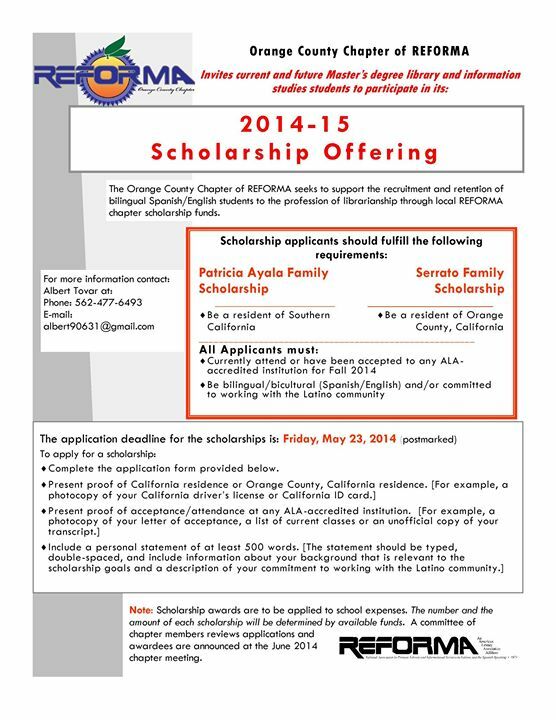 Patricia Ayala Family Scholarship  Be a resident of Southern California Serrato Family Scholarship  Be a resident of Orange County, California ______________________________________________________ All Applicants must:  Currently attend or have been accepted to any ALA-accredited institution for Fall 2018  Be bilingual/bicultural (Spanish/English) and/or committed to working with the Latino community Note: Scholarship awards are to be applied to school expenses. The number and the amount of each scholarship will be determined by available funds. A committee of chapter members reviews applications and winners will be announced at the June 10, 2018 chapter meeting.